From Tambobong Beach in Dasol, Pangasinan it was easily visible as a desert island of white sand with four gangling, widely-scattered coconut palms. On our first visit to Tambobong we couldn’t get any boat to take us here. The waves were just too strong at that time of the year. It took four years before we were able to return to Dasol and to attempt to get to Colibra Island again. After our visit to the beach at Balinmanok our boat finally made its way to this island. It’s sometimes spelled Culebra Island. In the past it has often been referred to as Snake Island for the poisonous sea snakes that made the island their habitat. The snakes are all but gone now, probably a testament to the increase in the number of visitors to this place. Approaching the island we were surprised by the moderately strong waves. Our boat was small – barely good enough for 5 people – and it didn’t inspire confidence amidst the ocean swell. A look at a Google map later revealed why: Colibra is located at the open South China or West Philippine Sea, and practically outside the protective sanctuary of Dasol Bay. No wonder boatmen were leery of going here during the amihan or northeast monsoon. This is a summer morning however, supposedly the safest time to travel here, and our boatman didn’t look that all worried. Creamy white sand and coral rocks at Colibra Island. One of the first things you notice about Colibra upon landing is the thick layer of creamy white, fine sand on the eastern and northern faces of the island. 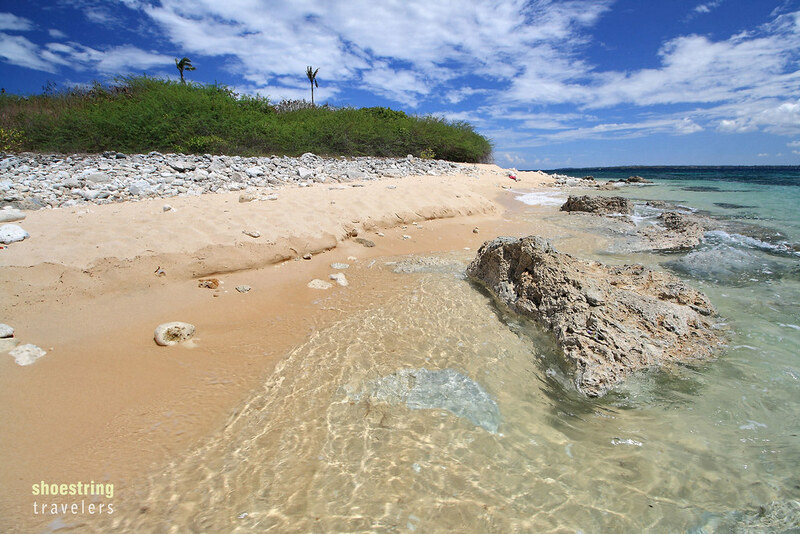 Coral rocks are scattered in haphazard fashion around the sandy beach. The waters are crystal-clear and in no time we succumbed to its lure and spent a good deal of our time swimming and snorkeling around the island. Elevated rock shelf on Colibra’s northern side. Colibra is actually an islet that can be traversed on foot in less than 15 minutes. The western side of the island that faces the open sea is dominated by an elevated rock shelf. The waves here are also stronger so you’ll find hardly anyone swimming in the area. The rock shelf continues on to the southern side but stops short of the shoreline so that there is a good portion of sandy beach available for swimmers. Sandy beach on the southern side viewed from the elevated rock shelf. With just four, widely separated coconut palms whose fronds appear to have been clipped by typhoon winds, Colibra has practically no shade except for a thicket of shrubs in the middle of the island. We saw at least two groups of picnickers who were using the tall shrubs for cover while grilling their food. With the waters so enticing for swimming however, we never thought about a shade even in the heat of the late morning sun. We’ve visited this place before. On our first visit here and with no boat willing to risk the strong waves, our host suggested we travel to Cabacungan Cove on foot. 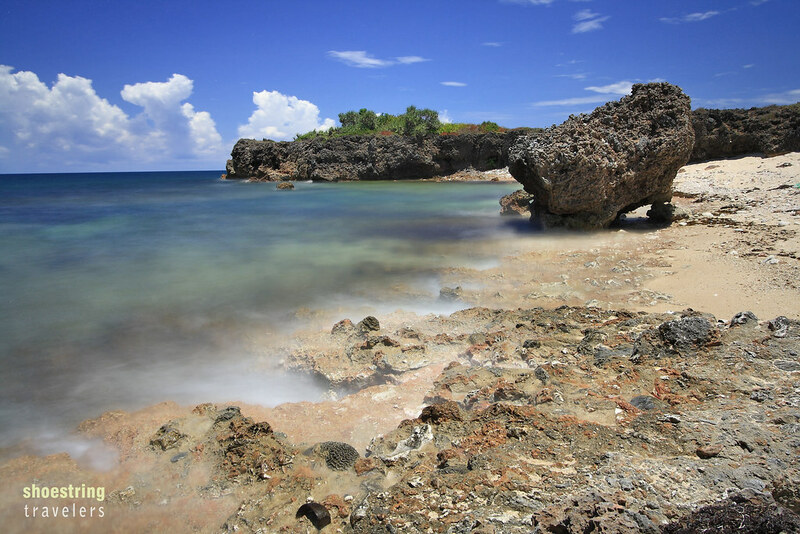 This cove is actually located on the western side of Balas Nagtaros Island, a rocky islet separated from the northwestern end of Tambobong Beach by a narrow channel. During our first visit, the tide had receded making it possible to cross the channel on foot to get to Cabacungan. It was a moderately long trek that afforded good views of the rocky shores this side of Dasol, but four years later we simply rode the boat to the island. The narrow channel from across Balas Nagtaros (picture taken on our first visit in 2011). On the way to Cabacungan from Colibra Island we passed by Crocodile Island, so-named for its resemblance to a crocodile head. It’s a rocky islet with no beach and such were the waves that it was practically impossible to dock here. We simply rounded the island for a close-up view before disembarking on Balas Nagtaros. Our boat didn’t dock right on Cabacungan Cove due to the strong waves there. Instead we disembarked on another side of Balas Nagtaros which was protected from the strong surf and had to walk up a low hill then down to Cabacungan. At the summit of this rise of ground you can get good panoramic views all over the area. The cove itself is surrounded by rugged rock formations. 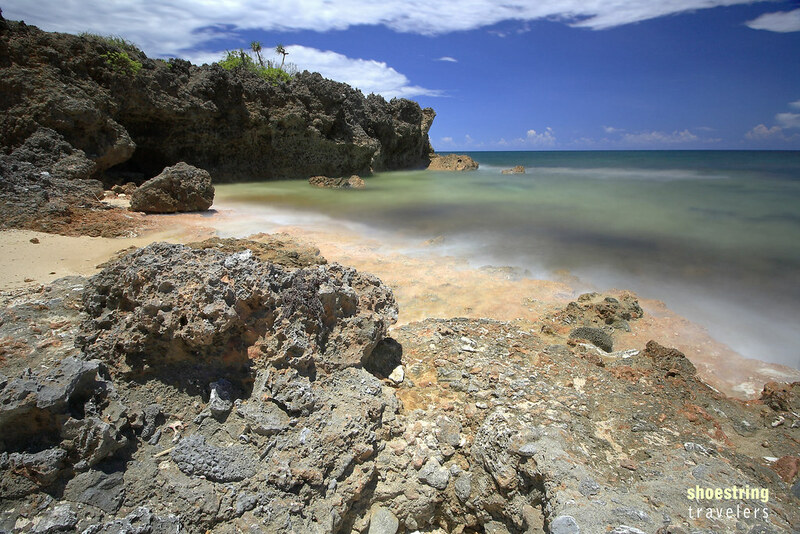 Like the beach further up north, Cabacungan’s beach is smothered with rust-colored and sun-bleached rocks. The strong surf here has obviously been doing its work. When we first saw this cove at low tide, several tidal pools had formed near the edge of the beach trapping several marine creatures. We remember being able to touch and observe several species of live starfish and big sea cucumbers – a specialty in Chinese restaurants back in Manila. With a strong surf pounding the beach this time, we just sat on higher ground and enjoyed the view. There is a small cave with an emerald-colored pool at the rock formation on the left that opens into the sea. 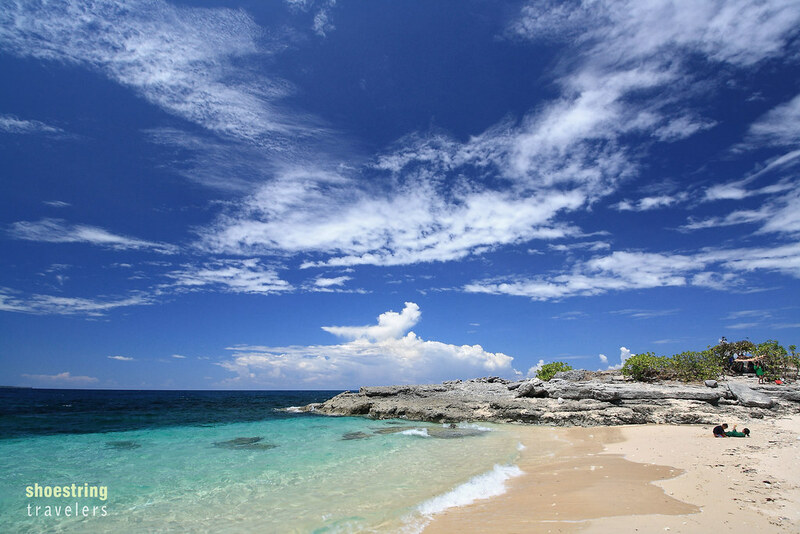 Unlike Tambobong and Balinmanok, Cabacungan Cove and the rest of Balas Nagtaros Island does not have any white sand beach. But the rocky shores have a beauty all their own. There is also a small cave in one of the rock formations at Cabacungan that exits into the sea and contains an emerald-colored pool. Cabacungan Cove was the last stop in our island-hopping, beach bumming itinerary for Dasol. 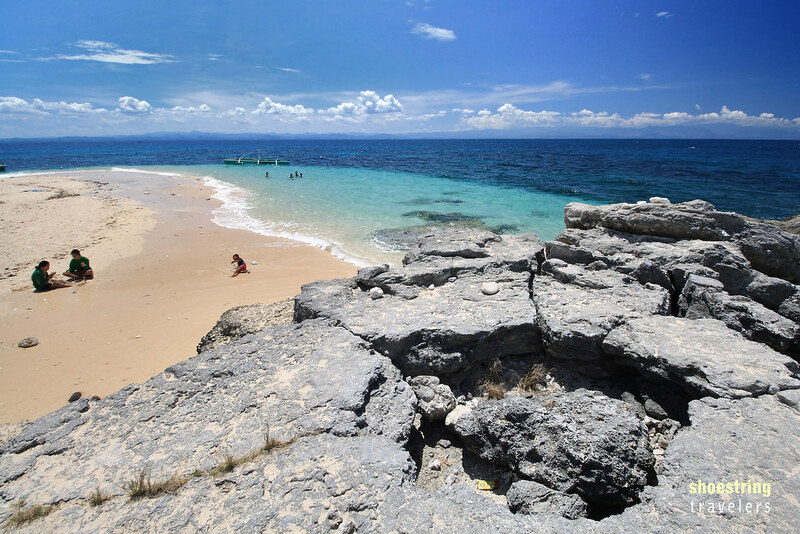 We wanted to explore the beaches to the north, in the town of Burgos, where beautiful Cabongaoan Beach is located. However the boatmen at Tambobong seemed unwilling to venture there. Perhaps it was the small size of the boats which would make for some rough going in the open sea to get to the Burgos beaches. For now we would have to savor our rediscovery of the beauty that is Tambobong. For directions in getting to Colibra Island and Cabacungan Cove, please go to this site. Posted in PangasinanTagged beach, Cabacungan, Colibra, cove, Dasol, island, outdoors, Pangasinan, philippines, travelBookmark the permalink. Just want to ask how much is the boat ride going to Colibra? Tyvm. By the way. Super nice captures you got! You’re welcome Kites. Thanks too!